Lori Lightfoot is the first black female mayor, gay woman to be elected as mayor for Chicago. For the first time, the city of Chicago has become the largest American city ever to ever elect a black woman as its mayor. On Tuesday former federal prosecutor Lori Lightfoot was voted to lead the city, replacing Rahm Emanuel, who has held the office for eight years, making her the city’s first openly gay mayor. 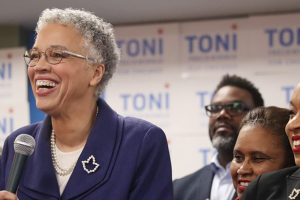 Lightfoot, who has not held political office before and considered an “outsider” in politics, easily beat her opponent, Toni Preckwinkle, a longtime, well-known politician with more than 74% when the vote was called in a final run-off election. Preckwinkle, who is also an African-American woman, is the president of the Cook County Board and former history teacher and alderman. “For Chicago, Ms. Lightfoot’s win signaled a notable shift in the mood of voters and a rejection of an entrenched political culture that has more often rewarded insiders and dismissed unknowns,” reports the New York Times. “We can and we will break this city’s endless cycle of corruption,” Lightfoot said during her victory speech on Tuesday, the Washington Post reports. “Out there tonight a lot of little girls and boys are watching. They’re watching us. And they’re seeing the beginning of something, well, a little bit different,” Lightfoot, who describes herself as “an out and proud black lesbian” told the crowd. Lightfoot came out as one of the top two vote-getters in the February election when she defeated a dozen other candidates who were vying to lead the country’s third-largest city. As a lawyer, Lightfoot has served in many positions, including being recently appointed by Emanuel to head the newly created police accountability task force.